Participants Attend Discussion at U.S. Mission to the United Nations! 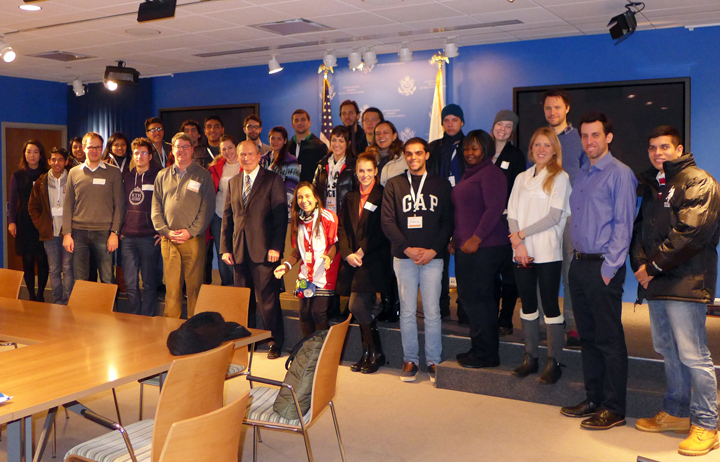 On December 9th, 2014, more than two dozen InterExchange Work & Travel USA and InterExchange Career Training USA participants braved the rain and wind to attend a seminar and discussion with Ambassador Ronald Godard at the U.S. Mission to the United Nations. Participants from Brazil, Chile, France, Germany, Japan, Netherlands, Nigeria, Paraguay and Spain had a unique opportunity to visit the Permanent Mission of the United States to the United Nations in New York and learn about the role of the U.S. in global affairs. Ambassador Godard discussed the U.S. role within the United Nations and shared some of his experiences working within such a diverse and multicultural organization. Participants were excited to hear of his work with the Organization of American States and several of his diplomatic postings in Guyana, Costa Rica and Chile. During the question and answer session, students were eager to hear how the USUN is engaging with other nations to address and respond to global issues including the Ebola outbreak and climate change. The United States Mission was created by an act of Congress 1947 to assist the President and the Department of State in conducting United States policy at the United Nations and represent the United States' political, economic and social, legal, military and public diplomacy interests.